So now the question is how tiny a difference can I detect? Adding small amounts of sugar to the water will change the index of refraction a tiny bit. That should change the angle by a small amount as well. If I can measure the angle very precisely, I should be able to detect very small changes in the sugar content of the water. I’ll try to get my students to build generation 2 of the device. Design, build, test learn. The work will teach them. This entry was posted in Science and tagged chemistry, lasers, microfluidics, Science on March 31, 2017 by Peter. There is a neat paper in this issue of the journal Lab on a Chip. The Tuteja lab out of Michigan developed a clever way of making droplets using a laser cut jig and an open platform. I mean literally open (not like open source). They make water in oil droplets that float across the surface of a hydrophobic chip. It reminds me a lot of the beer sphere. 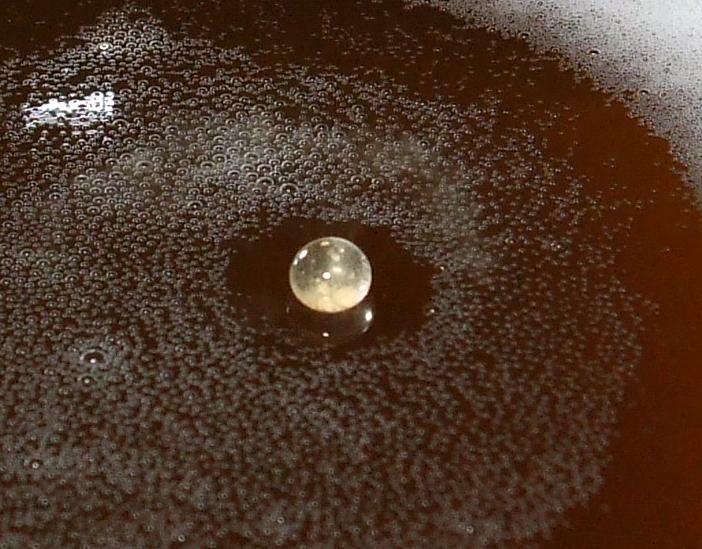 I caught this image of a beer sphere suspended on its surface tension on the surface of a glass of beer. It was so persistent that I was able to get my camera and come back to the table to take a picture. The Slo-Mo guys got really good footage of surface tension droplets. It’s an interesting phenomenon. Surface tension prevents a water droplet from merging with the water surface. If you have an oil surface, the water will not merge at all. Surface tension isn’t needed. But it looks similar. I meant to get in the lab this morning and fabricate some devices, but I am not feeling motivated. I ramble a bit about that in the video today. I’m very worried about science funding. That’s dumb. Can’t do anything about it. It’s worrying for nothing. But I am worrying anyway. That’s four hours of my life I will not get back. Focus on science. Rise above. This entry was posted in Science and tagged chemistry, droplets, microfluidics, Science on March 30, 2017 by Peter. “Monodispersed microfluidic droplet generation by shear focusing microfluidic device,” is from 2006. It’s a study on the design of the flow focusing droplet generator. It explores the role of flow rate and pinched geometry on the droplets. At the time, it wasn’t completely clear what these droplets could be used for. I was looking at them as little storage containers for cells. In 2016, digital PCR was a clear application of this technology. A PCR reaction was segregated into lots of little droplets. Each droplet either has a DNA molecule or does not. As a consequence, the PCR reaction makes it go green or not. Instead of trying to interpret different levels of green fluorescence (which is relatively hard to quantify), the scientist can just count the bright droplets (much easier to quantify). “Centrifugal micro-channel array droplet generation for highly parallel digital PCR” presents an unconventional droplet generator to make lots of little droplets for that application. The application I’m working toward is a little different. I want to make particles based on these droplets. The little particles will have a sensor on them so that we can detect what is happening near to the particle. The particle might then respond by glowing green or by releasing a drug. Similar particles have applications in cosmetics and lubricants. I think that we can make them smarter. We can apply them to research (reporting cell environments) diagnostics and maybe therapeutics (some day). This entry was posted in Science and tagged chemistry, droplets, microfluidics, Science on March 29, 2017 by Peter. One of the reasons I am trying to develop these techniques for acrylic microfluidics is to shorten the design-build-test feedback loop. With the PDMS techniques I worked on and grad school the loop is about a week long. It takes a day to design, a few days to get the photomask, and a day or two to fabricate. If nothing goes wrong, I use to be able to get a design tested on day five. With acrylic based microfluidics, the loop is much shorter. I can modify a design, cut it with the laser, fabricate the chip, and have it tested all within three hours. Three hours is a significant improvement over five days. This morning I came in and cut a new chip with some new parameters. I was hoping to see a narrower width channel which would produce smaller droplets. I didn’t get that, but I can try again (tomorrow not next week). Plus, I learned something. I need to add a viewing area to the chip to see the droplets better. I made a little video of some of the process. I skipped the bonding step in the video because it’s just 10 minutes of waiting while the hot press does its work. Here are parts 1 2 3 4, 5 and 6. This entry was posted in Science and tagged chemistry, droplets, microfluidics, Science on March 28, 2017 by Peter. I’m just going to do a brief update today on the microfluidics project. We set out to make acrylic plastic microfluidic chips that could generate tiny droplets of water in oil. Eventually, I hope to use these droplets to make polymer particles. We can make polymer particles from a water in oil emulsion. We usually just shake the mixture vigorously to make the emulsion. But that makes all kinds of different sizes and causes other problems as well. So now we’re going to use a much more complicated method: microfluidics. I have some experience with droplet based microfluidics. I worked on it in graduate school. It’s a simple idea. Flow oil and water through tiny tubes that merge into a single tube. This forces them to mix and they break up into little droplets. In practice, it can be pretty hard. One of the practical challenges is that it takes a stable flow rate to make homogeneous droplets. It can be a big challenge to get a stable flow. That’s especially true if your microfluidic chip is made of a stretchy material (I’m looking at you PDMS). It makes sense to move to a chip that doesn’t stretch at all like acrylic plastic. I had a great undergraduate come in and work with me this weekend on creating droplets with an acrylic plastic microfluidic chip. I had this working a few months ago but with much bigger channels. My first success was with channels that were more like 1 mm wide. The droplets were close to 1 mm wide as well. We set about to optimize a fabrication technique that would make smaller channels and then uses channels to make droplets. After much difficulty, we have succeeded. We are now making channels that are approximately 100 µm wide and making droplets that are approximately 50 µm wide. If you have an application that requires non-stretching microfluidic channels, please get in touch. We can send you one. Here are parts 1 2 3 4, and 5. This entry was posted in Science and tagged chemistry, droplets, microfluidics, Science on March 27, 2017 by Peter.